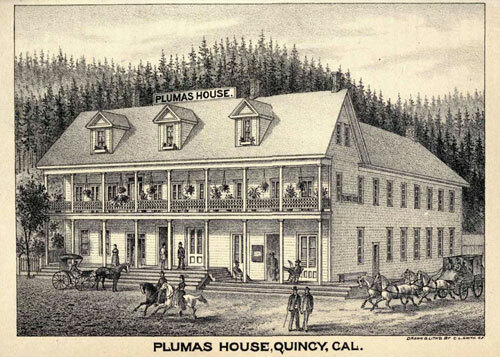 The original Plumas Hotel, built in 1853, was destroyed by fire in 1863. James Edwards rebuilt the hotel in 1866. 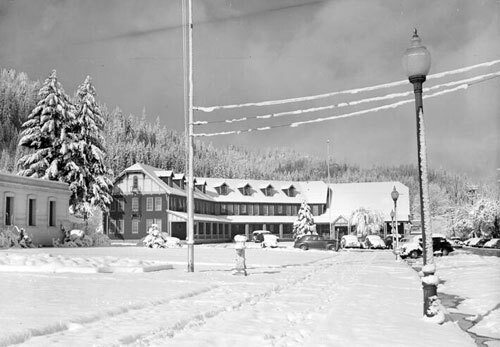 This second Plumas Hotel, one of the grandest in the mountains, survived until 1923 when it was likewise destroyed by fire. Two years later, the second Plumas Hotel was replaced by the Hotel Quincy, but it, too, burned in 1966. 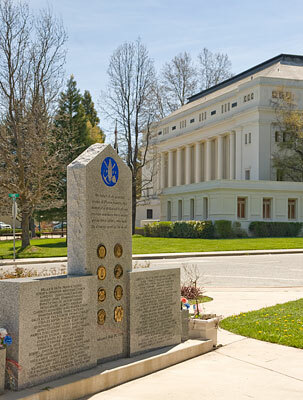 Today this property, adjacent to the grounds of the Plumas County Courthouse, is named Dame Shirley Plaza and contains the Plumas County Veterans Memorial. We were unable to locate a commemorative plaque for Plumas House. If you know of one, please contact NoeHill. The first and second Plumas Houses were built on this site. The second was built in 1866 by James and Jane Edwards. This hotel, the center of Quincy's social and business life for more than thirty years, burned to the ground on June 23, 1923.